Mould pressed rounded corner square bowl with short tab handle and curved sides. Clear glossy gloss glaze to interior and exterior of bowl. Flat base. Faux transfer print, aboriginal stencil design in black to interior base of bowl and top of tab handle. Set of six contained in white-painted metal tray with turned metal handles at each end. The story of Florenz is in some ways the story of Australia. Named after her Grandmother, Florence Maude Mills was born in Perth, Western Australia in 1894 to John Brier Mills and Mary Blanche Mills. There was also brother Arthur and sister Mary. The family lived in the suburb of Claremont. John was a Major in the Artillery and tragically died of wounds received at Gallipoli in 1915. For my overseas readers, the campaign at Gallipoli during the First-World War has become a defining moment in the history of both Australia and Turkey. A visit to Gallipoli is a rite of passage for young Australians traveling to Europe and the Middle East. Many Australians still have an ancestor or relative that served at Gallipoli and count it as a badge of honour. In 1916 Florence married George Robert Bertie Williams, a Draughtsman turned artillery officer. The couple moved to 20 Dudley Street in Haberfield, an inner western suburb of Sydney. They had 3 children Joan, Marie and George. 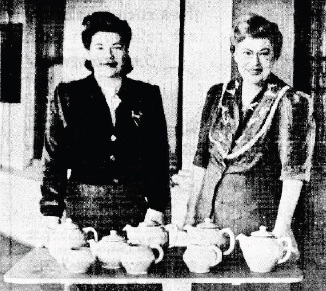 It was in Sydney that Florence studied pottery. They established Florenz Pottery Pty Ltd in 1934 in their garage (some people say stable but Florence said garage) at Marrickville, home of many of Sydney’s great potteries, such as Fowler, Diana and Studio Anna. George, ever the technician had built an oil-fired kiln, different to the traditional coal fired ones in use by most other potteries at the time. Their daughter Marie also worked at the pottery. Florence was experimented with firing lace to produce Dresden like figurines. Over the next few years they perfected this process. During the Second World War, Florenz, like other pottery companies turned production over to war work, gaining government contracts to make, among other things, porcelain insulators for radar. Wartime restrictions meant that only utilitarian pottery was to be produced, that is why so little decorative ware is found from this time. 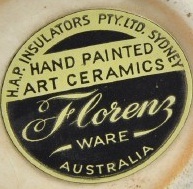 After the war Florenz had fifteen employees and started making resistance blocks for electric stoves purchased by the Housing Commission of New South Wales. They also made insulators for the power industry. Ceramic insulators are used in electrical equipment to support and separate electrical conductors without letting current through themselves. Next time you are walking around the streets, look up and you will see just how many ceramic insulators are on power poles. In 1942 the company went into voluntary liquidation, a common and legal business practice, and recommenced immediately at the same site as Florenz Potteries (000 164 214). The couple were then living just up the road at a property on the corner of Robinson Crescent and Illawarra Road Marrickville. The pottery was at 303 Illawarra Road, now the site of the “Good One” Vietnamese Barbeque (eat in or take-away). 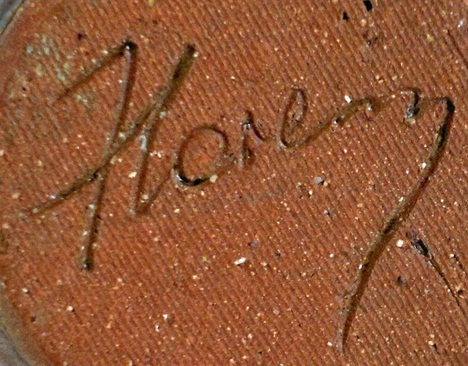 Many well known potters trained at Florenz, including people such as Harry Mammot. They made both hand thrown and slip cast ceramics as well as laboratory and hospital porcelain. Florence died on the 18th of September 1948 and George on the 1st of June 1957. In 1951 the pottery was sold to Johann Harves, a post-war German migrant, (Whose son Peter is now at the Coolangatta Pottery), Max Archer and Mr Pitcher. Johann’s son Peter now runs Coolangatta Pottery. 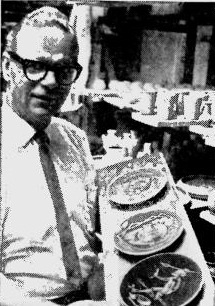 Altogether, the pottery operated from 1934 until 1980 when it was sold to Ron Cooper who owned K C Industries, (Casey Ware) who later made high quality porcelain insulators. In 1962 the company relocated to Brookvale, north of Sydney and continued under the Harves management until 1980. How’s the serenity? This is a quote from the 1997 Australian film classic, “The Castle.” This is the question you ask when you visit Australian Pottery at Bemboka. Another quote that springs to mind is that elementary law of the old west, “no matter how good you are, there is always someone better.” Judith and David are in that category. I think that I have a reasonable collection but theirs is far and away the best collection of modern Australian ceramics that I have ever seen. Why is this relevant? Because I bought these ramekins there and if you get the opportunity, I recommend a visit.